I was shopping at Ross the other day, and I saw a shelf full of coffee, so of course I went to investigate. Previous Ross adventures had led me to bags of decaf Casi Cielo, so I am always on the lookout. This trip did not disappoint; half pound bags of DECAF Komodo Dragon! 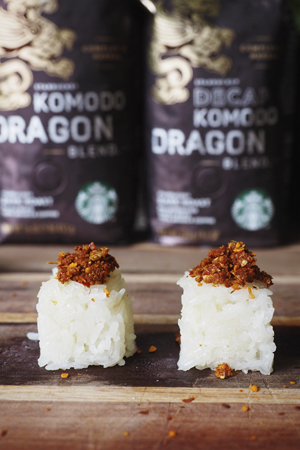 Starbucks used to carry decaf Komodo several years ago. It was our only Swiss Water processed coffee. Curious, I decided to pick up a bag. I had already been researching Indonesian recipes for an upcoming coffee pairing, but I came across ketan serundeng, which is sticky rice with a spicy coconut topping. I instantly knew I had to make this and pair it with Komodo Dragon.